aaah this is so cute <3 you did a wonderful job! Too... much... sweetness to... handle! Must... get... Hi Potion... or else... TOO LATE! Thankyou Katantoon for creating an Artwork of such beauty and cuteness that it killed me... AGAIN! 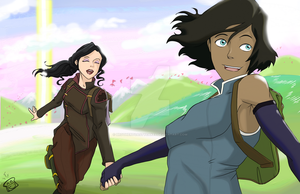 Asami: I think it's appropriate. The length of the flower chains kind of matches with out height, luv ya shorty!" wonderful job. I like your style. seems so soft and colorful. Ohhh how cute, thanks a lot for sharing! So, the first day is flowes, what are the other days? Cool. good luck. I probably won't be able to get all done in the week. but I am going to try hard this year. I hope you have a good opportunity to finish. I guess that I used the wrong phrase.